I say, “You go girl!” And I am not the only one saying this. Here are few things to know when Janet Yellen inevitably comes up in conversation this week. 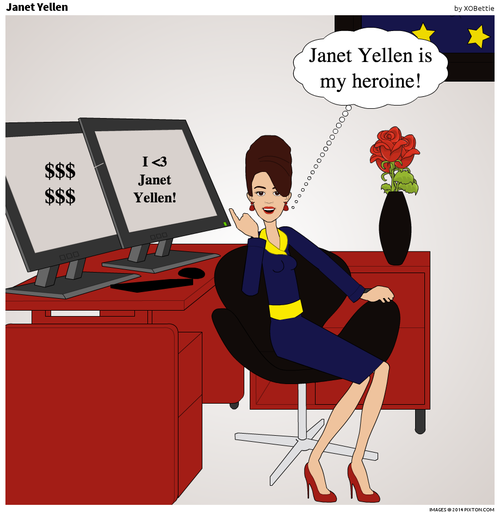 Janet Yellen is already the media’s darling and sparking women’s interest in economics. Janet Yellen is proving women can have it all—her key is having a supportive and similarly high-achieving hubby. Janet Yellen—breaker of the glass ceiling—is in a Microsoft commercial promoting ladies! If you want the straight facts, here is Janet Yellen’s bio, courtesy of The Fed. I wish Janet the best of luck in her new role. Thank you for being my trailblazer, Janet Yellen!